Surrounded by lakes, New York is known for its lake effect snow and freezing temperatures in the winter months. And, in the warmer months, tornadoes and thunderstorms are also common in your communities. Ability to withstand wind speeds of as high as 120 mph. Well insulated and will help lower energy costs. Many styles qualify for the Energy Star tax credit. Can reduce cooling and heating costs. Can typically be installed right over the top of existing asphalt shingles for an extra layer of insulation (and no tear-off). Looking for metal roofing in New York? We offer a variety of styles and colors to complement any architectural design. Many of our products include a 30 to 50 year warranty and we service all communities in the state of New York. Have your order shipped directly to the job site for added efficiency and time savings. Listed prices on the site are valid for any area in the state. However, some shipping restrictions do apply. Click here for details on shipping to your job site. 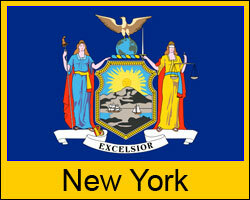 We serve New York City, Buffalo, Rochester, Yonkers, Syracuse, Albany and every New York town and community in between! Click here to go to our design and price center and get prices now!